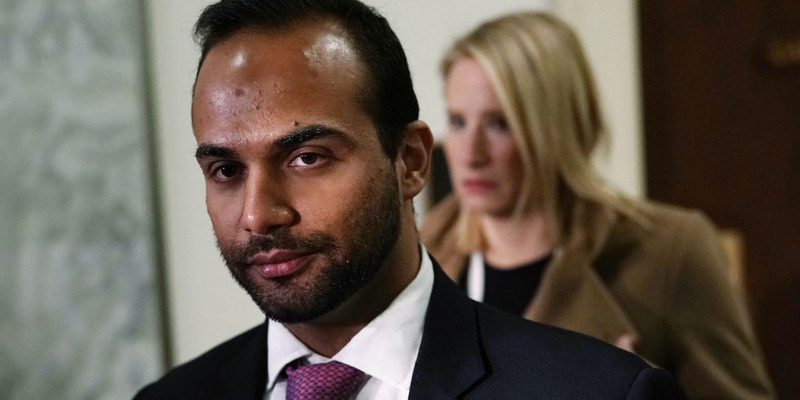 Alex Wong/Getty ImagesFormer Trump campaign adviser George Papadopoulos arrives at a closed-door hearing before the House Judiciary and Oversight Committee on October 25, 2018 in Washington, DC. George Papadopoulos, a former campaign adviser for President Donald Trump, is seeking immunity before testifying to the Senate Intelligence Committee, according to multiple reports. Papadopoulos’ request came the same day he delivered a 7-hour testimony to the House Judiciary and Oversight committees as part of a probe into previous FBI and Department of Justice investigations. The Senate committee is also investigating Russian meddling in the 2016 US presidential election. George Papadopoulos, a 2016 campaign adviser for President Donald Trump, is seeking immunity before he testifies before the Senate Intelligence Committee, according to multiplereports. Papadopoulos’ request reportedly came the same day he delivered a 7-hour testimony to the House Judiciary and Oversight committees as part of a probe into previous FBI and Department of Justice investigations that surrounded the 2016 US presidential elections. The Senate’s investigation concerns Russian meddling and possible collusion with the Trump campaign in the 2016 election, for which Papadopoulos’ ties to Russian officials made him of particular interest. CNN first reported the immunity request, followed up by the Washington Post, but the status remains unclear. The special counsel Robert Mueller’s investigation found last year Papadopoulos had made at least six attempts to set up a meeting between the Trump campaign and Russian representatives throughout the course of the 2016 presidential campaign. The former campaign staffer, who was sentenced two weeks in prison last month for lying to FBI investigators, said on Fox News Friday he was “framed” in the investigation and was considering withdrawing his guilty plea that concerned conversations that promised “dirt” from the Russian government on then-Democratic candidate Hillary Clinton. Papadopoulos, who Trump has described as a low-level volunteer, was the first former campaign member to detail knowledge of Russian efforts to interfere in the 2016 presidential election while it was ongoing. Mueller previously recommended that Papadopoulos be sentenced to as many as six months in prison.